The Beach is a neighbourhood located in central Toronto. The area mainly features detaches homes and is a suitable option for couples and retirees. 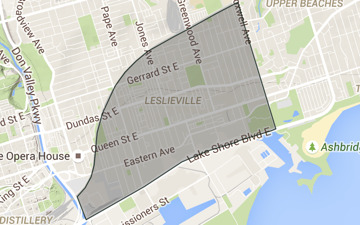 Leslieville is a neighbourhood located in central Toronto. The area mainly features semi-detached homes, and is a suitable option for families, singles and couples. Leaside is a neighbourhood located in northern Toronto. The area mainly features detached homes and is an attractive option for families with children.